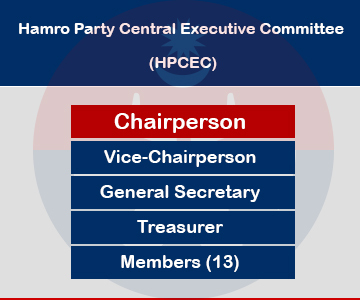 The Hamro Party Central Executive Committee (HPCEC) consists of 21 members. Fourteen members, including the chairperson, are elected by the party’s Central Assembly and seven are nominated by the majority vote of the fourteen elected members. The chairperson nominates a vice-chairperson, a general secretary and a treasurer from the central executive committee members. 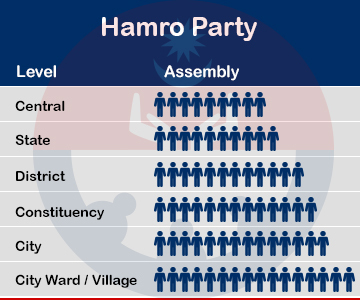 The Hamro Party state, district, constituency, city, city ward and village executive committees mirror the composition of the HPCEC.